I read this post about how damaging pocket money can be to children with regard to their ability to save. It is an informative article, and it makes sense. Think about it for a moment, whether you come from a wealthy family where you received pocket money every month plus extras or a middle income family where your parents gave you pocket money and then encouraged you to do chores around the home or go out and get a job as a paper delivery boy or waiter, the result is that you were earning money. 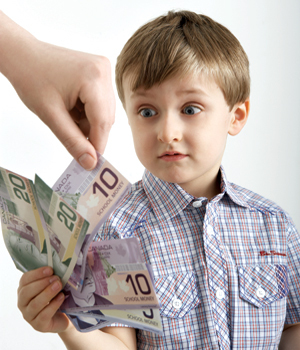 The survey revealed that children who get given pocket money without any incentive to work for it and encouragement to save the pocket money towards something that they want teaches them to expect money to be given to them on a monthly basis without having to work for it, the article related this to ‘state dependence’. Regardless of how old your children are, starting them off at a young age by encouraging them to ‘work’ for their pocket money and then save for items they want, teaches them to how to handle money so that in the future they will continue to save and work for what they want. I think I am going to start with this tonight at home, tell my children that their pocket money will be according to their success in completing chores around the home without a gripe! I give my 2 kids pocket money for chores too, it helps the family out and teaches them they have to work for things. We have also signed them up for Roosterbank.com which seems to be helping them save. I guess the next thing is to look for a child savings account for them. Roosterbank.com is a great idea! I’d never heard of it until now – can see how it can teach about the value of money and really encourage being responsible with money too.